Two options are already available in some parts of Europe, the translucent Kadrilj and the opaque Fyrtur. Both are powered by USB-rechargeable battery packs, and come with a wireless remote for control without smart devices. 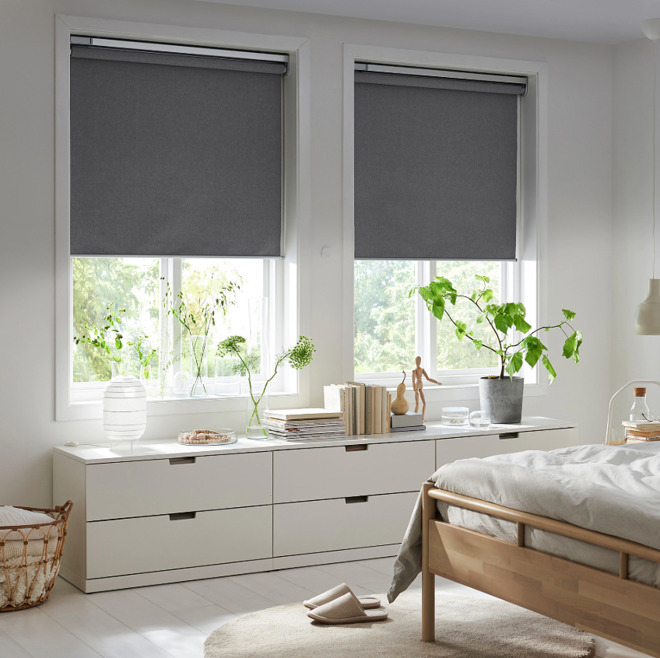 When paired with a Tradfri hub, the shades will support HomeKit, Amazon Alexa, Google Assistant, and Ikea's own Tradfri app for iPhones and iPads. Sizes range from 60-by-195 centimeters (23.6-by-76.8 inches) to 140-by-195 centimeters (55.1-by-76.8 inches). European prices range from 99 to 155 euros, or about $113 to $181. The Smart Shades should see wider availability starting Feb. 2, possibly including the U.S., though that could happen as late as this spring. 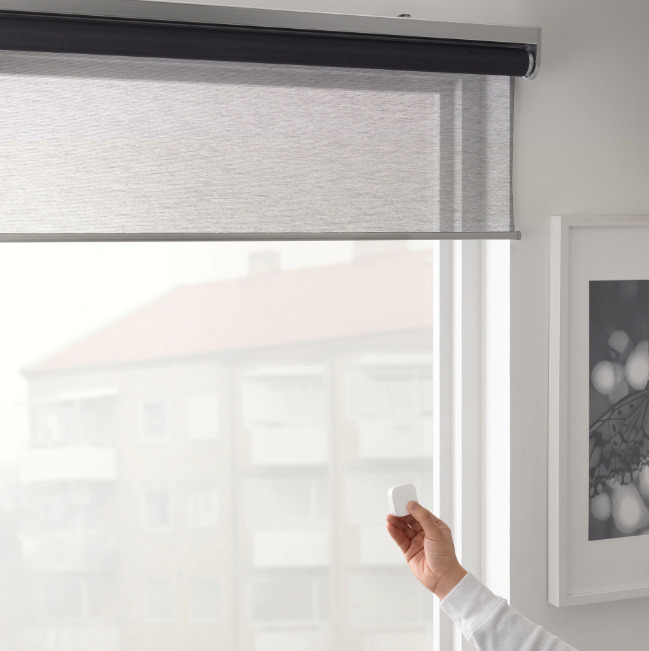 Ikea has been slow to step into the smarthome space, but now offers a range of Tradfri-branded plugs, lights, and motion sensors, often costing much less than other HomeKit-compatible options from the likes of Philips or LIFX. The company even has Bluetooth speakers, battery packs, and wireless chargers, though these don't have any platform integration. Apple themselves is appearing at CES this year for all intents, partnering with various companies for joint PR and promotion. Is that out-of-character for Apple in recent years? If so it seems to me like more evidence of embracing the Amazon and Google model for expanding their footprint. I hope they are making their presence more directly visible at CES. It’s a big world and Apple [iOS] is now the de facto standard in the premium consumer electronics space. They should be actively promoting integration, not just partnering with companies that wish to prefix their product categories with ‘smart,’ but also evangelizing the concept of a smarter physical world directly to consumers. That’s marketing that Google and Amazon certainly have done better, and more of, versus Apple. I hope they are making their presence more directly visible at CES.... evangelizing the concept of a smarter physical world directly to consumers. That’s marketing that Google and Amazon certainly have done better, and more of, versus Apple. More of yes, but vs. Apple? IMO Apple has done a horrid job at evangelizing their concept. At least until a change in tactics quite recently Apple's ideas for a "smarter physical world" have been stuck in mud and not even in the conversation for most folks. It's been an Amazon/Google duopoly with both doing much better than Apple at promoting, explaining and integrating 3rd party devices in their ecosystems. That doesn't mean that a slower-to-adapt-their-vision Apple won't be equally effective as those two in the near future. It's so early in the smart-home market that there's no reason Apple would be left out in the cold. As you say they are perceived as a more premium experience in general, and have a rabid fan base. I cannot imagine what people are talking about by suggesting Apple has done a horrid job with HomeKit, since it's an optional API framework for product builders to use, and one which has filled my house with useful devices...and operating more securely than the other platform brands. In fact, the only device I have that doesn't offer HK is one made by none other than Google -- the Nest, where they have willfully decided not to implement HK, likely in an attempt to destabilize Apple's ecosystem, regardless of how entirely user-hostile this is. We are reminded who butters Google's bread -- advertisers, and rarely end-users. They make so little from hardware they simply don't need to care about building good hardware for end-users. Anyway, the shades are a welcome addition to the HK landscape... The current crop by the leading blinds company are outrageously expensive -- $600+ a window in my home. Non-starter. Hopefully Ikea's will make this more approachable. Bummer about needing a bridge tho.